Say Hello to the Orme Park Turtles! 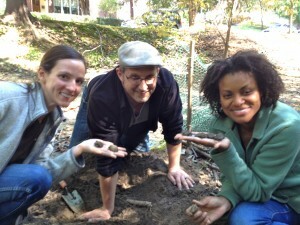 Editor’s Note: Thanks to Lola Carlisle for the pictures included in this article. Sometimes good things happen to people who wait. Other times they happen to people who take action. In June, VaHi resident Paige Cucchi and her husband Sean witnessed a snapping turtle laying her eggs in the middle of the walking path on Orme Park’s northeastern edge (across from 818 Brookridge). Click here to read about the Cucchi’s encounter and resident efforts to protect the nest until the eggs hatched, and hopefully ensure the hatchlings short but treacherous trip to the nearby creek. 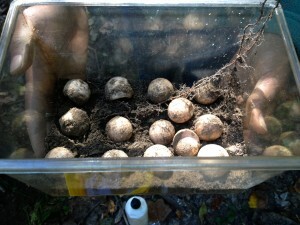 It was thought the eggs might hatch as early as late July or early August. But when summer turned to fall, concerned residents – many of whom had modified their daily walking habits to check on the status of the nest – began to wonder when – or even if – the young turtles would make their appearance. 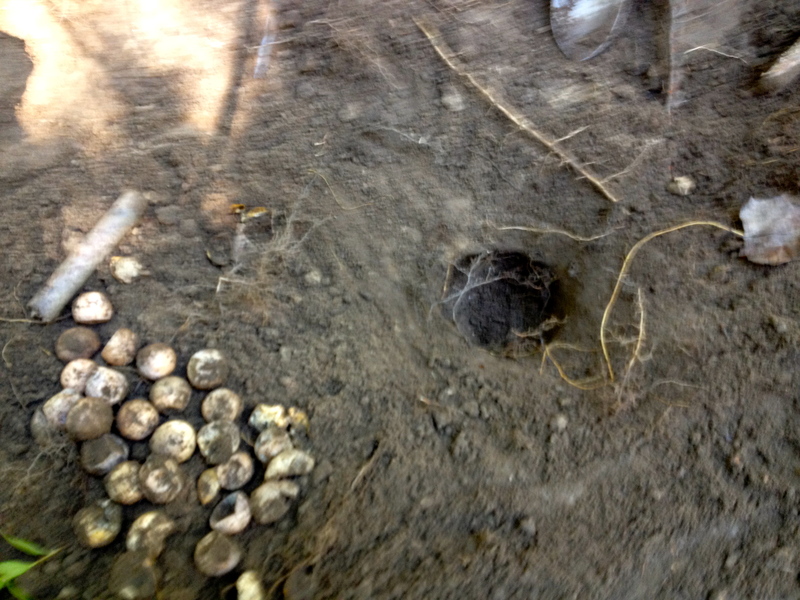 Most were reluctant to dig up the nest for fear of harming the hatchlings or otherwise disturbing their natural birth process. Fortunately, VaHi resident Anita Wallace, who volunteers at the Atlanta Botanical Garden’s Amphibian Conservation Program, saw our post about the Orme Park turtle nest and shared it with her supervisor. As amphibian research coordinator for the Department of Conservation Research at the Garden, Mark Mandica knew something was awry when the hatchlings hadn’t made their appearance by mid-October. 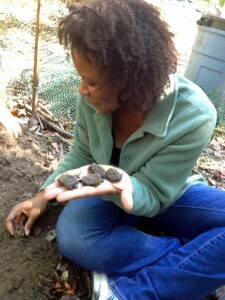 Mark Mandica’s wife Crystal does her part to help rescue the Orme Park turtle hatchlings. Mandica reached out to the VHCA and offered to lend his expertise. 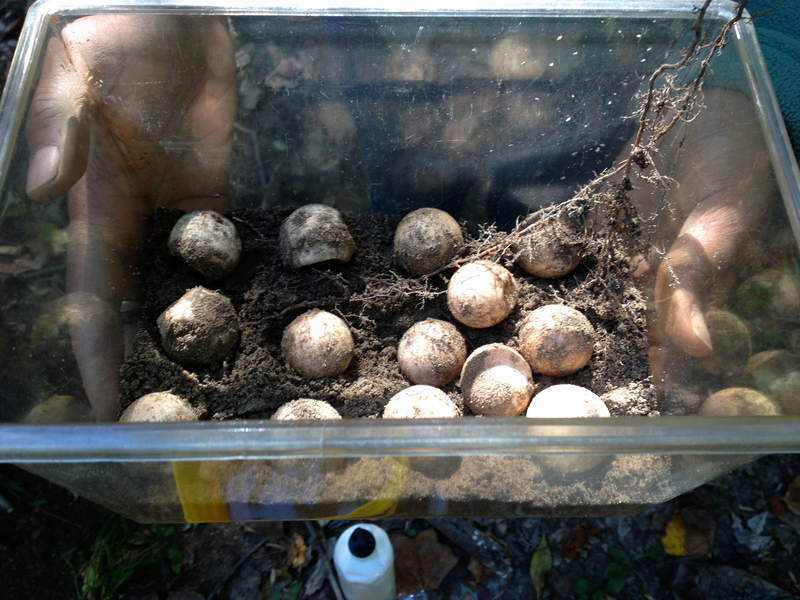 When Mandica inspected the nest on Wednesday he determined the hatchlings were definitely overdue, and that the reason for their failure to appear was likely the dense, compacted soil in which the nest was buried. In a rescue operation worthy of major media coverage, Mandica and two others dug up the nest and, in fact, found numerous young turtles struggling to make their way to the surface and then on to the creek. If Mandica and crew had not intervened, all of the hatchlings would most likely have perished. Amazingly, all ten hatchlings were rescued, although one unfortunately did not survive the short trip to Mandica’s home. Three of the remaining nine appear somewhat lethargic, but the rest are frolicking in the bathtub playground Mandica’s created for them. Dehydration is the major concern at this point. Mandica’s watching them closely, though, and he’s hopeful that, now that they’re in water and receiving nourishment, all nine will make a speedy recovery. No doubt about it: ABG Department of Conservation Research amphibian specialist Leslie Philips, Mark Mandica and Mark’s wife Crystal (l-r) have earned their gold star for the month by rescuing the Orme Park turtles. Mandica will observe the baby turtles for the next week or two, after which the survivors will be released into the creek in Orme Park. VHCA plans to organize a turtle release event and interested residents will be invited to attend. We hope to also include an educational component at the event during which Mandica can help attendees better understand the plight of these wonderful creatures which he describes as “a species most people would just as soon kill.” When a time and date for the event are confirmed, we’ll let you know. Click here to view a video of the grateful hatchlings thriving in Mandica’s bathtub. This entry was posted in news and tagged ormepark, turtles by John Becker. Bookmark the permalink.